The BTE is a popular style worn behind the ear that connects to an earmold that rests inside the outer ear. Sound is conducted from the hearing aid into the earmold. Although this can be the largest type of hearing aid, it is also the most powerful and often the easiest to adjust. BTE hearing aids are appropriate for the treatment of almost all types of hearing loss. This innovative design allows for significant power with good feedback control. Some previous behind‐the‐ear users have gravitated to this Custom Remote Mic Half Shell (HS-RM). Arguably the current most popular style of hearing instruments. This model offers high cosmetics, acoustic performance and minimal or absent occlusion effect. Many patients feel it has a “natural feel”. Can be connected to wireless accessories. Hearing aids are available in a range of styles. During your appointment, Charles A. Reger will explain the advantages and benefits associated with each hearing aid style suitable for your particular hearing loss and lifestyle. Licensed Audiologist Charles Reger will help you determine what style makes the most sense with your loss, listening environments and budget. Behind-the-ear (BTE) – The BTE is a popular style worn behind the ear that connects to an earmold that rests inside the outer ear. Sound is conducted from the hearing aid into the earmold. Although this can be the largest type of hearing aid, it is also the most powerful and often the easiest to adjust. 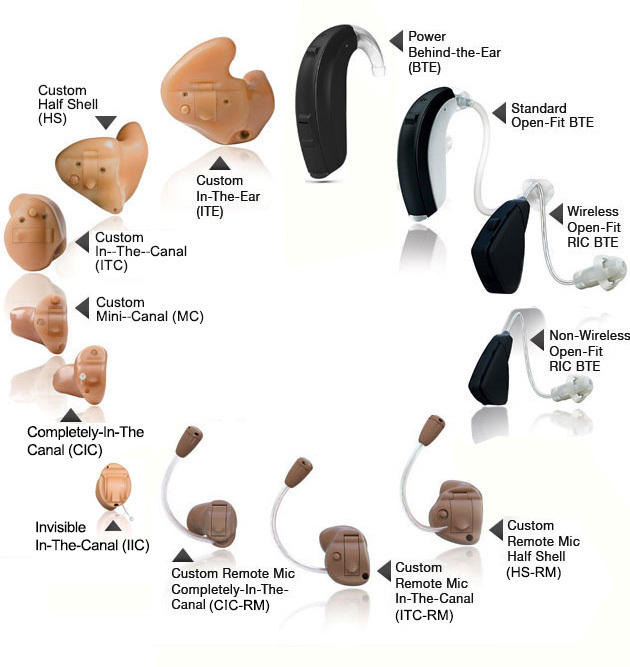 BTE hearing aids are appropriate for the treatment of almost all types of hearing loss. Completely in-the-canal (CIC) – This customer hearing aid model is molded to fit completely inside your ear canal. The outer faceplate of the shell is barely visible in the ear canal. The CIC is a very discreet option that can fit a mild to moderate hearing loss. Contact Charles Reger & Associates Hearing today. We’ll help you find the hearing aid style that makes the most sense for you.